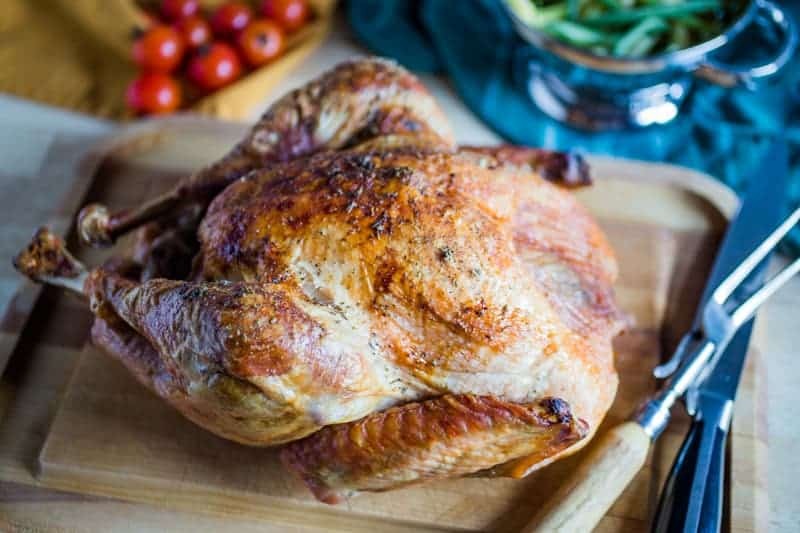 Simple recipe on how to make an Easy Roasted Turkey with perfectly crispy skin and moist meat without a lot of fuss. Place this beautiful turkey on the dinner table to impress family and friends this holiday season. I’m a bit of a roasted turkey snob because of my Mom. Her turkey is the best you’ll ever have and the way to do it couldn’t be easier: simply baste it with melted butter and white wine every 30 minutes. That’s it! The result is a perfectly roasted turkey every single time with the moistest meat and crispiest skin around. How long to roast a turkey? About 3 to 3 1/2 hours, or until a thermometer inserted in the inner thigh registers 165°F/73C. There are also all sorts of opinions about how to roast a turkey and I can already hear the hootin’ and hollerin’ about how basting is totally unnecessary because the only way to a truly moist turkey is through brining. I love to brine poultry and do it a lot during the year, just not on Thanksgiving. You see, the Thanksgiving tradition in my family is to baste and basting is what makes me happy, so I do it. Maybe it’s the hot liquid flowing over the slowly crisping skin. Maybe it’s the wonderful roasted turkey smell that fills the kitchen every time you open the oven door. I don’t really know why it comes out perfect, time and time again, but it does, and it feels like home. The butter, wine, and just plain ol’ salt and pepper are honesty enough to add flavor to an already flavorful bird. Although, I’ll admit I sometimes sneak some fresh sage sprigs into the cavity of the turkey or a little rubbed sage in the wine/butter mixture. Love the flavor the earthy sage adds to the mild tasting meat, but please don’t tell my Mom. If stuffing a turkey, chicken, and duck is more your thing, check out this Turducken recipe with homemade cornbread sausage stuffing. This showstopper definitely takes more time to make, but it’s so worth it! Don’t forget the cranberry sauce too! Whether it’s for a holiday dinner or any other time of the year, hope you try this Easy Roasted Turkey recipe. Please let me know below how you like it! 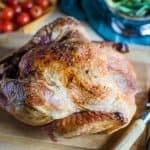 Simple instructions on how to make an Easy Roasted Turkey with perfectly crispy skin and moist meat without a lot of fuss. Place turkey, breast side up, on rack in a shallow roasting pan. Combine the white wine and melted butter, pour over the turkey, then sprinkle with the salt and pepper. 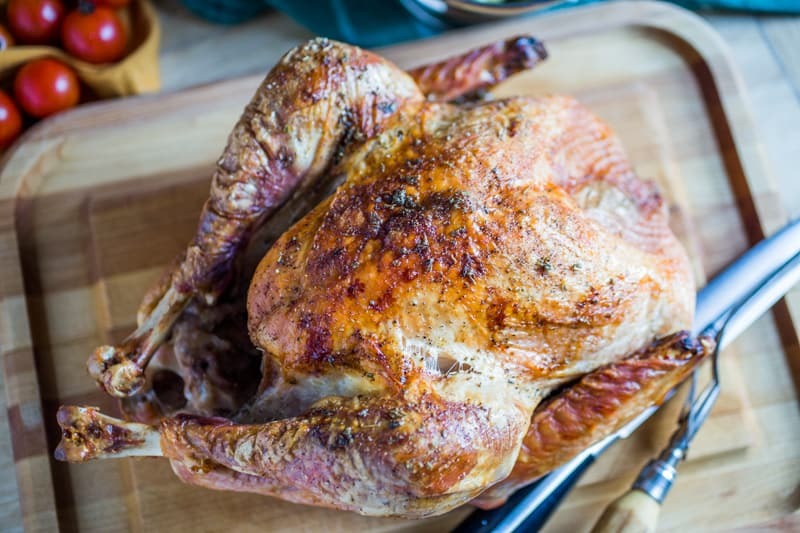 Place the turkey in the preheated oven and let roast undisturbed for the first 1 1/2 hours, then baste with the butter/wine pan juices every 30 minutes until turkey is fully cooked, about 3 to 3 1/2 hours in total cooking time. *Can add a little more wine to the pan if needed for basting juices and loosely tent the turkey with foil if it starts turning too brown. Turkey is done when a meat thermometer inserted into the inner thigh registers 165°F/73C and the juices run clear. Remove the turkey from the oven and place on a cutting board. Allow to rest for 25-30 minutes before carving to allow the juices to redistribute. In the meantime, make a tasty homemade gravy with the pan juices! I’m telling her unless you mail me some biscotti. The mint girl scout cookie kind please. Thanks. Oh my gosh, Karrie! You weren’t kidding when you said this was easy. I can’t believe there are only 2 ingredients involved in the making of this turkey, but when you have wine and butter…well that’s all you really need! That skin looks incredible!! Mom knew what she was doing! That is one pretty turkey Karrie!! I love any excuse to cook with wine…. that means a glass for me with whatever is left! Happy Thanksgiving! .Your turkey looks absolutely perfect! The combo turkey, white wine, and butter sounds good because let’s be honest, Karrie, butter and wine make everything better, right? :) Delicious recipe!